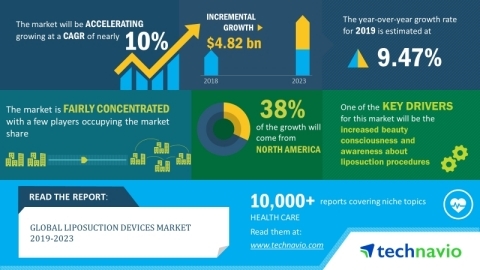 LONDON--(BUSINESS WIRE)--The global liposuction devices market is expected to post a CAGR of close to 10% during the period 2019-2023, according to the latest market research report by Technavio. Consumers are becoming more beauty conscious and are increasingly focusing on enhancing their aesthetic appearance. Liposuction procedures are adopted by people who face difficulties in losing weight through diet programs and exercise regimens. Liposuction procedure helps people achieve a stable, healthy weight and smooth, toned contours. The increased benefits of liposuction coupled with factors such as the growing beauty consciousness among people will drive the adoption of liposuction devices among end-users such as hospitals, cosmetic surgical centers, and ambulatory surgical centers. As per Technavio, growing medical tourism and increasing healthcare infrastructure in emerging economies will have a positive impact on the market and contribute to its growth significantly over the forecast period. This global liposuction devices market 2019-2023 research report also analyzes other important trends and market drivers that will affect market growth over 2019-2023. Individuals are increasingly opting cosmetic procedures such as liposuction as they are safe and provide satisfactory outcomes. Many individuals from developed countries are traveling to emerging countries such as Thailand, Malaysia, South Korea, and Mexico owing to the availability of liposuction procedures at affordable prices in these countries. The growth of the medical tourism industry and the formation of tourism clusters such as Bangkok are creating a high demand for cosmetic procedures. Further, the healthcare infrastructure is continuously improving in developing countries such as India, where medical facilities are being equipped with the latest technologies. The rising disposable income and access to affordable healthcare services in emerging economies are resulting in the emergence of more healthcare centers performing liposuction procedures, thereby positively impacting the growth of the market. “The technologies associated with the cosmetic surgical equipment are witnessing continuous advancements to cater to the growing demand from end-users such as hospitals and specialized cosmetic clinics. Vendors are increasingly focusing on developing new technologies such as power ultrasound, and laser-assisted devices for large-volume liposuction procedures. Such technological advances in the field of liposuction devices will have a positive impact on market growth during the forecast period,” says a senior research analyst at Technavio. This market research report segments the global liposuction devices market by end-users (hospitals, cosmetic surgical centers, and ambulatory surgical centers) and geographic regions (Asia, Europe, North America, and ROW). The hospitals segment held the largest liposuction devices market share in 2018. The growth of this segment is due to the increasing number of individuals visiting hospitals for liposuction procedures owing to the availability of better infrastructure in hospitals as compared to cosmetic surgical centers and ambulatory surgical centers. The North America region led the market in 2018, followed by Europe, Asia, and ROW respectively. The US dominated the market in the region in 2018. The dominant share of the North America region can be attributed to the presence of several vendors that offer liposuction devices in the US. With over 500 specialized analysts, Technavio’s report library consists of more than 10,000 reports and counting, covering 800 technologies, spanning across 50 countries. Their client base comprises of enterprises of all sizes, including more than 100 Fortune 500 companies. This growing client base relies on Technavio’s comprehensive coverage, extensive research, and actionable market insights to identify opportunities in existing and potential markets and assess their competitive positions within changing market scenarios.